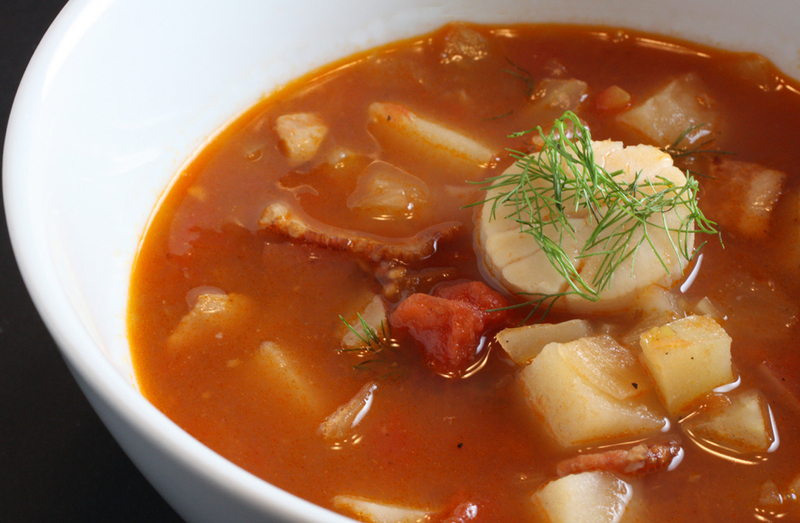 But here I had a big bottle of Absinthe Verte and no Pernod in the house when I spied a recent New York Times recipe for Manhattan Bay Scallop Chowder with Fennel. The easy soup looked wonderful, but called for three tablespoons of Pernod. With its similar anise-flavor, I wondered if I could substitute my absinthe instead. ‘Course, absinthe is way more potent than Pernod, but that’s beside the point, right? Well, when the nice folks at San Francisco’s Jug Shop got wind of my intentions after I broadcast my culinary plan on various social networking sites, they grew concerned. They told me to proceed with caution before passing “Go.” After all, Pernod is 40 percent alcohol; Absinthe Verte is a whopping 60 percent (120 proof). So I stirred up my soup pot of crispy bacon, fennel seeds, fennel bulb, garlic, potatoes, plum tomatoes, and clam juice. The recipe called for 1 pound of bay scallops. I used what I had on hand — a 1-pound bag of larger Trader Joe’s wild Japanese scallops (20/30 count; just be sure to remove the tough small muscle on each scallop before using) — which worked beautifully. Then it came to the moment of truth. I started conservatively, stirring in only 1 tablespoon of absinthe at first, then tasting. Mmm, totally fine, I thought. So I added another tablespoon, and tasted. Again, it didn’t seem too strong at all. So I added the final tablespoon. The soup had tasted as if it was missing something before I added the spirit. But once that was incorporated, the absinthe really brought all the flavors together, and heightened the fennel taste. This light, bright chowder was briny, anise-like, and sublty sweet from the tender scallops. The Green Fairy had done good. In a soup pot, cook bacon until golden, 3 minutes. Add onion, salt, pepper, and fennel seeds and cook, stirring, until onion is limp, about 5 minutes. Stir in the celery, diced fennel, garlic, and bay leaf, and saute for 10 minutes longer. Add potatoes, broth, tomatoes and their juices, and clam juice. Bring to a simmer and cook for 20 minutes. Add Pernod (or absinthe) and simmer for 10 minutes more. Chop fennel frond to yield 2 or 3 tablespoons. Add to pot along with bay scallops. Simmer gently just until scallops are cooked through, about 2 minutes. Serve with oyster crackers if desired. A wonderful combination! Fennel and absynth must go well together… Scrumptious! Sounds delicious! Good to know absinthe worked fine. Excellent substitution! I like that you went slowly and tasted after each tablespoon. Pernod is a brand of pastis, which was developed in the early 20th century to mimic the flavor of absinthe after the later was outlawed. (Henri-Louis Pernod opened his first absinthe distillery in Switzerland in 1797.) Because pastis was designed to taste like absinthe, it makes sense that absinthe could be used in many dishes calling for pastis. BTW, I too gag at the taste of most licorice products, and I abhor the flavor of pastis as an aperitif, but I love the flavor when used in cooking. Here’s an example: I learned this recipe many years ago from Roland Passot . That looks like a wonderful dish to try, Peter. Thanks for sharing it. So, I’m guessing you think it would be OK for me to use absinthe in the dish, instead of pastis (which, of course, I have none of at home)? Leave it to me to have nothing but absinthe around. Oh man, this sounds SO good – and in this rainy weather I can’t think of anything more perfect! I’ve always been a strict Boston chowder fan, but this may be the one to even the playing field. Carolyn – when the sales of Absinthe Verte start jumping they better start keeping you in good supply! And then you went and made illegal soup by French standards. Genius! OK, now I know what to do with the little sample bottle of Pernod Absinthe. Perfect, good recipe. Will try it. I didn’t realize it until an Italian friend told me, fennel grows wild in the Bay Area. We had a big stand of it in our rather wild backyard in Berkeley. She took it, sliced it, made it into a salad and put it into soups. Question: Could a few snakk slices of fennel substitute for the fennel seeds in the recuoe? Bill, I think you could probably add more fresh fennel if you don’t have fennel seeds at hand. Creative use of Absinthe:-) I (unfortunately) have a bottle of pernod that’s been sitting in my cupboard for over a year, so I look for any excuse I can find to cook with it since I refuse to drink it. I probably should explain, Pernod, the original absinthe maker, is making it again, following the original formula. Don’t know what happened to the aperitif called Pernod. Maybe it’s still around. This is much after your post, but do you think a person could sub Anisette liqueur, which is what I have on hand?